The Beatles Song Of The Day is “We Can Work It Out.” “We Can Work It Out” was the Beatles “Christmas Single” for 1965. It was some kind of single- a double- A side single with “Day Tripper” on one side and “We Can Work It Out” on the other. 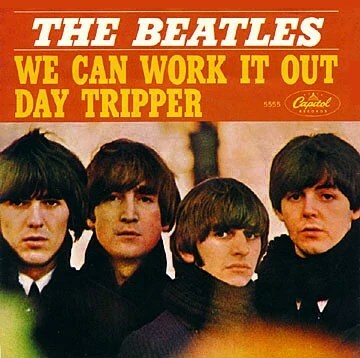 “We Can Work It Out” it #1 in the United States, “Day Tripper” #5. The two songs today are found on The Beatles Past Masters Volume 1″ album. “We Can Work It Out” was written by Paul McCartney and John Lennon. Paul wrote 2/3rds of it. Paul wrote the optimistic part of the lyrics, John comes in with the ‘life is very short and there’s no time for fussing and fighting my friend.” The song is thought to have been a song Paul wrote concerning his relationship with the actress Jan Asher. Paul had the view that he wanted his girl at home, Jane was an actress and at the time the song was written had left London and Paul to do some acting. In the end Paul and Jane didn’t work it out. The song was written at Paul’s father’s house. Great great song. This song was also a turning point. John Lennon had been on a roll, For two years he was the dominate and superior songwriter. From this point on Paul had stepped up his game and was his equal. This was a favourite of both John and Paul’s and although the song was about Paul and Jane- it could also be looked at in the rear view mirror of being about John and Paul. John Lennon: harmony vocal, acoustic rhythm guitar and harmonium/ Paul McCartney: double-tracked vocal and bass guitar/ George Harrison: harmony vocal/ Ringo Starr: drums and tambourine. The song was recorded on October 20th and 29th, 1965 at Abbey Road. Producer: George Martin. Rating “We Can Work It Out” on a scale of 1 to 5 stars ***** a classic. Rolling Stone Magazine ranks “We Can Work It Out” at #30 on their “The Beatles 100 Greatest Songs’ list while Spignesi and Lewis rank it at #38 on their “100 Best Beatles Songs” list. The Beatles spent the largest amount of time up to then- 11 hours in the studio working on this song.